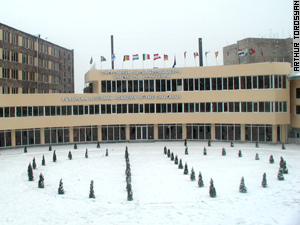 The European Regional Academy of Armenia offers a program that combines educational influences from several European countries including Germany, France and Austria. Its first year of studies began October 4 with 230 students. "After studying in Yerevan University of Engineers, I realized that the educational quality doesn't satisfy me," says 21 year old student Areg Sukiasyan from Tehran. "I transferred to the European Regional Institute of Information and Communication Technology of Armenia to study media specialty. The study is very optimal here." The media institute is part of the overall program of the European Academy, where students can study in several different disciplines. The first level of study is in the Bachelor's program, after which those choosing to can continue to gain a Master's degree. "We will prepare only qualified specialists without fail. And education is competitive here," says the head of the Academy Sergey Bichakhchyan. Bichakhchyan says the new Academy takes a more practical approach to applied education and that upon completing their studies: "Each student of the Academy must realize that after getting high qualification he or she will be working in Armenia first of all." The major divisions of the Academy include law, linguistics, nature protection and cultural cooperation. "The methods of teaching informational technologies in the Academy correspond to the European standards," says deputy head of the Academy on the external relations and programs of development Aghasi Avetisyan. "We learn things which are now required in the local and international markets taking into account required specialists." Bichakhchyan says the Academy also will "re-train" professionals whose skills might be outdated or jobs made obsolete in the current career environment. "I've graduated from the Department of Philosophy of Yerevan State University in 1996. I realized that the future is informational society," says specialist of social philosophy 29 year old Vardan Tumanyan, who studies in the Academy's Department of Application Programming. "I've started again from the beginning." 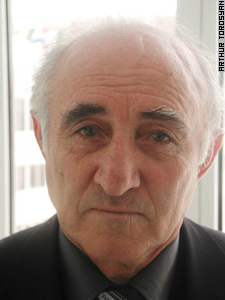 Nairy Babayan, 25, graduated from the Institute of National Economy in 1996. He is an economist and expert on merchandise. He says, however, that his education didn't correspond to the new market. "Now I'm studying in the Department of Media and Informatics," he says. "Those who come here must realize what they are coming for." Some of the Academy teachers will receive training in European countries to refresh their specialties, while teachers from those countries will come to teach in Armenia. Hayk Sharkhatunyan teaches four groups of 20 students each in the informatics Department. "The Academy will give new quality to the Armenian educational system," he says. "It is a new method of studying. We teach new ways of thinking." Graduates of the Academy will be given diplomas of the particular European university from which their curriculum originate as well as state diplomas. Study in the Master's program lasts two years, four months. Those wishing to be retrained in a specialty graduate in two years, six months. Iranian student Kamuar Kojuri, 21, transferred to the Academy from the University of Engineers. He originally came to study in Armenia because tuition fees are lower than neighboring countries, but "the educational quality is very high." The first class at the Academy includes 30 foreign students - from Iran, Syria and United Arab Emirates. The tuition fees is $780 per year and Master's courses cost $880. Twenty percent of students study for free, based on scholastic merit. "Only those who have high educational level are on the list of those 20 percent," Bichakhchyan says. "And we take into account that level both during entry examinations and during their study. At the end of each year the contest for the free tuitions for next year will be conducted." The foreign student program is financed by the European Union which, Bichakhchyan says, found Armenia to be the most democratic republic in the Trans-Caucasus region. The Council also considered Armenia's geographic location and its ability to be a link to regional countries. Bichakhchyan says the Academy has also recently signed a contract with the British Council for cooperation with Cambridge University. "That program will make international positions of Armenia more stable," the Academy leader says. "Leading European universities didn't pay attention to it just for nothing."